There are so many milestones to celebrate in a child’s journey to reading. Surely one of the best is that moment of dawning wonder when kids realise they are actually deciphering the squiggles on a page to make sense of them - "I CAN READ!" But high up there on my list is also when children recognise the humour in a picture book. It might be the text, the illustrations, or more likely the combination - and they express it in a grin and twinkling eyes, or a belly laugh and some floor-pounding. I have tried and tested the picture books below with a group of kids from 1 - 4 years old. The result was often children begging me with tears of laughter in their eyes to re-read the book, and they have laughed even more the second time. From my review: Please Open This Book was written by Adam Lehrhaupt, illustrated by Matthew Forsythe and published by Simon and Schuster (2015). The book’s cover comes with advice (warning? ): Books That Drive Kids Crazy. I can absolutely corroborate that. But it’s crazy in a good way: my kids couldn’t believe I was silly enough to be reading aloud “This is a ball.” when the simple illustration was so obviously a box, instead. By the time we came to the page “This is a scary monster.” depicting a princess, even the littlest ones were emphatically shouting “No!” Despite all this denial, and screams of laughter, by the time the end of the book came we had “Read it again, PLEASE!” It's by Beck and Matt Stanton and is an ABC book, published by HarperCollins (2015). All the Mo Willems books I’ve read have been wonderful. In Don’t Let the Pigeon Drive the Bus, the Pigeon quite understandably wants to drive the bus and keeps asking the listening kids to allow him to do so. His excellent bribes and complaints sound awfully like the same ones kids would use! It’s this kind of interactivity that my kids adore - the same sort of involvement you see in a great pantomime. Children just love to be the ones bossing the Pigeon around. 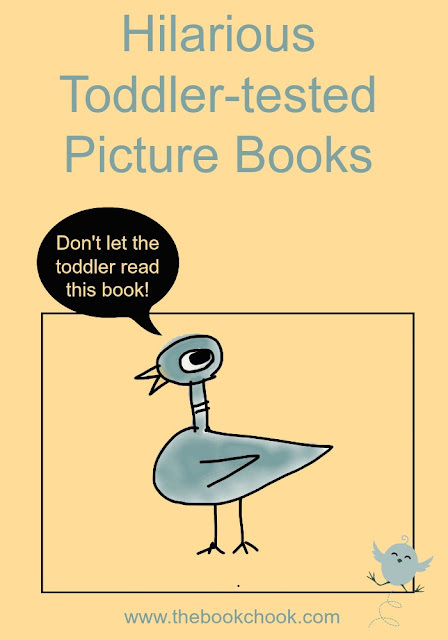 From my review: “… written and illustrated by Mo Willems and published by Walker Books, 2014. From the publisher: Smell? What smell? I don t smell. YOU smell. The Pigeon needs a bath! Except, well, the Pigeon's really not so sure about that... Besides, he took a bath last month! Maybe. It looks like it's going to take some serious convincing to get the Pigeon to take the plunge! Take a look at your local book store or library and ask for the Mo Willems section - satisfaction will be around the corner! The invitation to play mentioned above is what helps make many picture books great. Kids respond to it instinctively and learn to associate something they love - play - with something we hope they will love - books and reading. When kids laugh aloud at a picture book, when they “get” the humour and beg for more, you can bet they’re equating reading with something full of pleasure. And that’s what we, as their parents and teachers, want. Understand I’m not saying hilarious picture books for children are the only ones to look out for. But I can guarantee if you do, something magical will happen both for you and the children you share them with. What hilarious toddler-tested picture books are in your repertoire? You might be interested in my List of Top Children’s Picture Books 2015 and Top Children’s Picture Books 2014. Find more Children's Book Reviews on The Book Chook by clicking Reviews in the right sidebar.